Behind your ears, in dead of night, cultivates your fears, unearths your fright. Can you hear the trumpet song? Few notes of tune, you follow the sorrow, pitied by moon, won’t last till ‘morrow. The martyrdom won’t be for long. A sunstroke prairie of wheatgrass and red-yellow-red tents attracts a crowd of the inquisitive and judgemental. The red noses and painted smiles soak up the rays, and as day comes to gloam behind the canola, a new presence draws the shadows from our minds and attracts all walks of life that thrive when their phantoms are most defined. Deformities within barred train carts can pull a sneer from behind any man’s teeth. Past the money-pocketing posters and maze of all things horror show, rears a tent most spectacular. Magnificent feats and daredevil stunts turn a greedy face stupefied. Grotesque disfigurement and absence of abidance turns a stupefied face vain. Backside the ruckus, a shy man plays a sad tune. A trumpet, is what he puckers his lips around, and he tickles the three piston valves at such a rate, one would not expect the song to be heavy-hearted. As a shy man, none have ever witnessed the sound of his voice. Some say he never had one. He never partook in any merriment or festivities; he stood behind the train carts and exhibits and swayed to his sad songs. They called him the Trumpet Man. Once every month or so, a curious mind would follow the sorrow carrying on the winds and lend an ear to the Trumpet Man, and this would satisfy his soul with such bliss and cheer that his eyes would gleam with gratitude and his fingers twiddled a new song, a laughing-bliss of flurried notes. Smiles dawned that brightened the eyes of the hungry and softened their hearts enough to care for an, altogether, new type of freak. He knew, the Trumpet Man, that their appetite would not last till morning, so he served meals of classical songs; composed songs that lingered in their guts to maybe appease them just enough for them to return for a second course. Never did it deliver their company any further. Diners never bestowed their company to a dish unless they could melt it down into a momento; a knife, perhaps. The Trumpet Man didn’t mind, for he longed for moments like these. Days came to pass and less people would sniff out the sad tune, then less people would be engorged by the sounds he crafted and his prowess would remain untouched, unappreciated. The sad songs became sadder and the periods between these meals would be longer up to entire years where not a single guest had come to listen. The Trumpet Man expired soon after. A rather cold day in early November froze his breath as he posed on the ground, huddled against the painted wood of a train cart, thawing the frosted wheatgrass beneath him. The circus and freak acts moved onto another town and the cart that supported his spine was taken, leaving his body slouched in the damp, littered, grassland. That was then, and then is then, not now. Now, the Trumpet man waits on the secluded brick streets of city blocks. 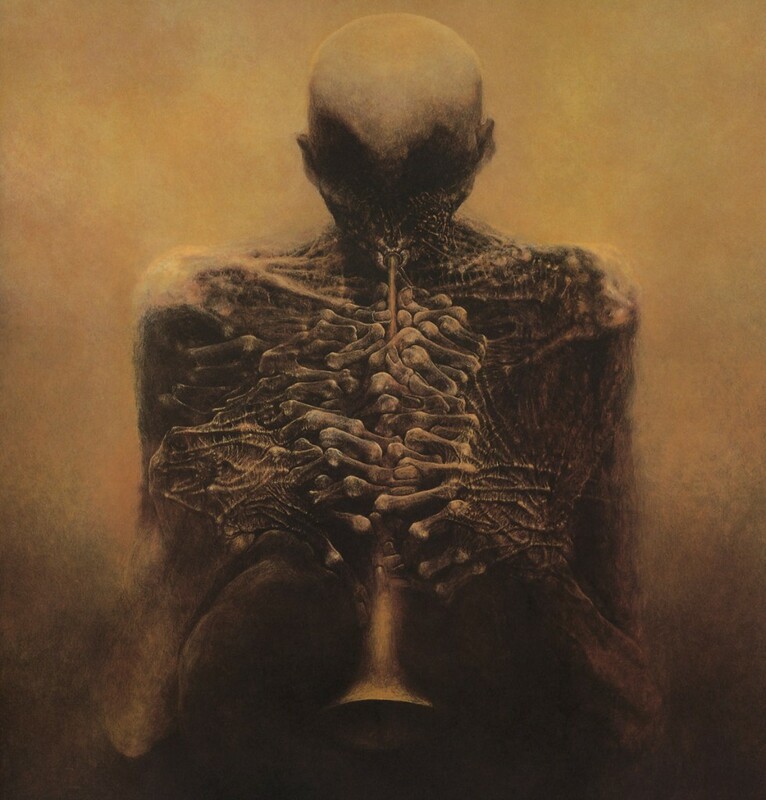 He plays the tunes just the same and those that smell the heavy heart of the Trumpet Man will come to find him, or what was once him, webbed with rot to the side of a building, his fingers moaning through his trumpet. These songs are different, however. If one seeps in through your skin and reaches your bones, you are helpless but to pursue the melody to the feeder, being the entity that howls these songs. He won’t let you forget him, no, not this time. It will forevermore be an itch in the back of your mind, an itch, then a cut, then a bullet hole as it grows ever louder and louder and your eyes become blurry with vibration and your mind a static void all except for this song and it will never end, never, not until, well, not until you kill yourself. That’s all he ever wanted, someone to listen. In your eyes, and back of your mind, pleasure to your cries, in melody you wind. I hear the trumpet song. I love how you’ve written in music references to help readers hear the soundscape to the movie played by your words. My favorite line, ” as day comes to gloam behind the canola..” reminds me of my prairie childhood. You’ve honestly described my farm view. Thank you. Thank you for sharing your exquisite writing. I’m honored.